London 6 April 2011: Portrait of a young woman with a drawing instrument by Dresden painter Carl Christian Vogel von Vogelstein, represents one of the artist’s finest early works and for 70 years has hung in Dresden’s Gemäldegalerie. Following its claim to Dresden in 2009, the Commission for Looted Art in Europe (CLAE) now announces the restitution of the painting to its rightful owners, the heirs of the three Rosauer sisters of Vienna. CLAE’s research on behalf of the family revealed how the Vogel von Vogelstein was seized by the Nazis in 1938 and acquired in 1940 for the Dresden Museum by Hans Posse, Director of the Dresden Gemäldegalerie and head of Hitler’s Special Commission Linz, tasked with collecting works for Hitler’s planned museum in Linz, Austria. It was sold to Posse by Hitler’s dealer, Julius Böhler of Munich, who acquired it in 1938 in Vienna for 800 Reichsmark, selling it on to Hans Posse in 1940 for 4,500 Reichsmark. When the Nazis took power in Austria in March 1938, the three Rosauer sisters were in their late 70s and lived quiet domestic lives in Vienna. As a result of Nazi persecution, they lost their apartment, their paintings and their lives. The elder sister Malvine died in Vienna in 1940 and the two younger sisters, Bertha and Jenny, were murdered in Treblinka in 1942. Only one great nephew, Rudolf Epstein, was to survive. This is the second restitution by CLAE of a painting from the Rosauer collection. In October 2010 CLAE recovered from the German government Portrait of a young woman in white holding a music book in her hands in a landscape by Johann Baptist Lampi the Elder. This painting had also found its way to Böhler in 1938 who sold it in 1940 to another of Hitler’s dealers, Karl Haberstock, who in turn sold it Hitler’s Linz Collection in April 1941. The Nazi takeover in Austria provided a great business opportunity for both German and Austrian art dealers. Both the Vogel von Vogelstein and the Lampi were among the large quantity of paintings seized from Jewish collections and taken to Germany after the Anschluss in March 1938. CLAE has worked closely with the SKD to achieve the restitution of the Vogel von Vogelstein painting and would like to acknowledge the important commitment of the German authorities to the just resolutions of these claims. Susan Freeman, Rudolf Epstein’s niece, said: “When Rudi Epstein escaped to England, he had lost his parents, all his relatives and arrived with just a few belongings. One of his possessions was an aquarelle of the library of his three great aunts, depicting many of their paintings and works of art. Rudi spoke fluent German, Czech and English and worked as an interpreter at the Nuremberg trials. Long before it became possible to reclaim such works of art he always dreamt that one day, for the sake of his aunts and lost family, it would be possible to return the paintings and works of art to their rightful heirs. He always spoke to us about the looted art collection. 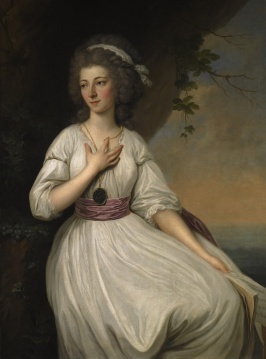 When he died, he bequeathed the Rosauer collection to his great niece. We have kept his dream alive. It was an on-going dream. It was just by chance that we made contact with Anne Webber. Thanks to Anne, the dream became an on-going reality. Photos reproduced by kind permission of the Rosauer family. 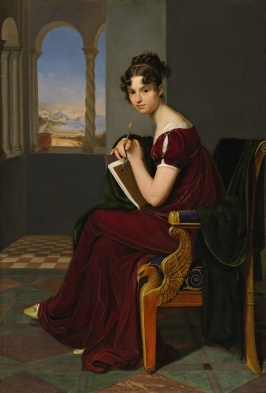 Painted in Rome in 1816, the painting depicts Countess Thekla Ludolf, née Weyssenhoff, sitting in an Empire chair in a sumptuous red dress, holding a drawing book and instrument. Behind her, through the arch of the balcony, lies a beautiful vista of the Bay of Naples and Mount Vesuvius. Vogel von Vogelstein later became a portraitist at the Court of Saxony and Professor of Painting at the Dresden Kunstakademie. Lampi was an Austrian portrait painter. He became a Professor at the Vienna Academy in 1786 and later worked at the court of King Stanislas Augustus Poniatowsky in Poland and in Russia at the invitation of Prince Grigory Potemkin. The Commission for Looted Art in Europe (CLAE) is an international, expert and non-profit representative body which researches, identifies and recovers cultural property looted during the Nazi era on behalf of families, institutions and governments worldwide. It negotiates restitution policies and procedures and promotes the identification of looted cultural property and the tracing of its rightful owners. CLAE is mandated to represent the European Council of Jewish Communities and the Conference of European Rabbis. For more information on CLAE and its recent work please visit the following website www.lootedartcommission.com. The Central Registry of Information on Looted Cultural Property 1933-1945 (The Central Registry) is an international research centre and repository of information on Nazi art looting and restitution. It provides detailed research and up-to-date news and information from over 49 countries and an online database of over 25,000 looted or missing objects from 12 countries. The Central Registry is a charitable body, operating under the auspices of the Oxford Centre for Hebrew and Jewish Studies, an independent unit of Oxford University. Ambassador Stuart E Eizenstat, Special Advisor on Holocaust Issues to Secretary of State, Hillary Clinton, is Honorary Chairman of both CLAE and the Central Registry. For more information please visit the following website www.lootedart.com. Anne Webber and David Lewis are the co-founders and co-chairs of CLAE and the Central Registry.